Back in November on Pepero Day (11/11), my co-teacher told me about some other candy/chocolate-related holidays in Korea, invented by candy companies, most likely. I was already familiar with Valentine's Day, February 14, but she said that in Korea the woman is supposed to give chocolates to her man of interest on that day. Then on March 14 ("White Day"), it's the man's turn to return the favor and give candy to the woman. April 14 is "Black Day", which is when single people (who haven't received chocolate or candy on the previous two months' 14ths) get together and eat a bowl of black noodles called jjajangmyeon (짜장면). Wow, okay. But how much are these made up little holidays actually celebrated, I found myself wondering. Wait - there was more! She continued: And then in May on the 14th it's "Rose Day" / "Yellow Day". Couples give each other roses and often wear yellow. She might have told me about a few more of these little commercial holidays, but I don't recall. While searching online later, I found out there's a holiday on the 14th for nearly every month in Korea! So today was White Day, March 14. One month after Valentine's Day. I got to school and was walking through the hall to my office when I saw a boy with a big plastic container of something and two girls around him peering into it. I slowed down and gave them a curious glance, but didn't stop and make them small talk with me. I kept walking down the hall, and then I heard the boy call my name "Ms. T------!" I stopped and turned around. He gave me a sucker, which is what his big plastic container was filled with. I don't like candy, so I added it to my candy stash for the students (prizes for when we play games in class). We still don't have an English classroom (ours has been occupied by a class of second graders since the start of the school year because their classroom is under construction or something), so while in each fifth grade homeroom for English class today I received four more suckers. They also got added to the candy stash. While White Day did make today a bit more memorable than a regular day, it was completely overshadowed this afternoon when two separate fights broke out during my after school 2nd grade daycare class. The kids are coloring, and I'm going around to each student to ask for their names, which I then write down on a piece of paper so I can learn their names. I'm kneeling at two desks in front, getting the names of those two boys. They're in a good mood. Another boy is out of his seat, we'll just call him Chay, and he's up front by these two seated boys (let's call one Ming). Chay and Ming get into a scuff over a pencil or something of very little importance while I'm right there. Ming stands up and there is some shoving, and then Chay meanly hit and pushed Ming. Then all of a sudden the two boys were frozen. It somehow ended up that Chay was on my right side and Ming on my left. They were glaring at each other with the angriest faces I've ever seen. I could see them breathing heavily and I could almost read Ming's thoughts: Oh no you didn't. You did not just push me. You're going to be sorry for that. (Looking back, they should have been punished immediately at this point for the hitting and shoving they'd already done, but the Korean teacher - who doesn't speak English - was working on the other side of the room and had completely missed the whole scene. The only English these boys understand are very simple things like, "Hello, how are you? ", so I didn't know what to say to them, but I didn't want to leave from my current position between them.) While this intense staring happened, I found myself saying aloud slowly to them, "Breathe, breathe", and made loud breath sounds while slowly moving my hands up and down with the inhale/exhale to try to calm them down. But I was invisible to them. They'd shut out everything else and could only see each other. This intense staring and angry breathing kind of slowed down time, and I remained unsure what to do. Maybe they were okay? The next part happened fast; the details are kind of hazy. I don't know who moved first, if it was me or Ming, but Ming (from my left side) was walking towards the back of the classroom. I followed, making my way around to check on other students in the back. Chay also made his way to the back, but via another row. Before I knew it their anger had exploded and they were going at it, kicking and grabbing each other. Many students were watching, and I remember being shocked that the Korean teacher in the room hadn't said anything yet. But she was behind me, and I wasn't going to turn around to look at her when this fighting was happening in front of my face. So I made my way over to the boys to try and stop them. As I'm within their reach, Chay gets pushed back so hard he falls to the ground, hitting his head on a desk on the way. He starts to cry. Now the Korean teacher finally notices, so she comes over (it's kind of awkward that I'm standing right there by them when she sees, but I couldn't explain what had happened) and takes both of them to the side of the classroom to give them a stern talking to and make sure the injured boy was okay, I can only assume. Not ten minutes later, Ming is fighting with a different boy in the back of the classroom. I didn't see how that one started, but the Korean teacher pulled them off of each other and then took them aside again. An acquaintance in Korea just posted a screenshot from his phone of its 'Emergency Dialer' and Report School Bullying has its own emergency number, 117! This is one of aspects of teaching in Korea that I find to be extremely hard -- not speaking Korean and thus not knowing what is going on emotionally with the students. All of a sudden there are fights or tears and all I can say is, "STOP, be nice!" or "It's okay --" Great posters with very powerful visual information. 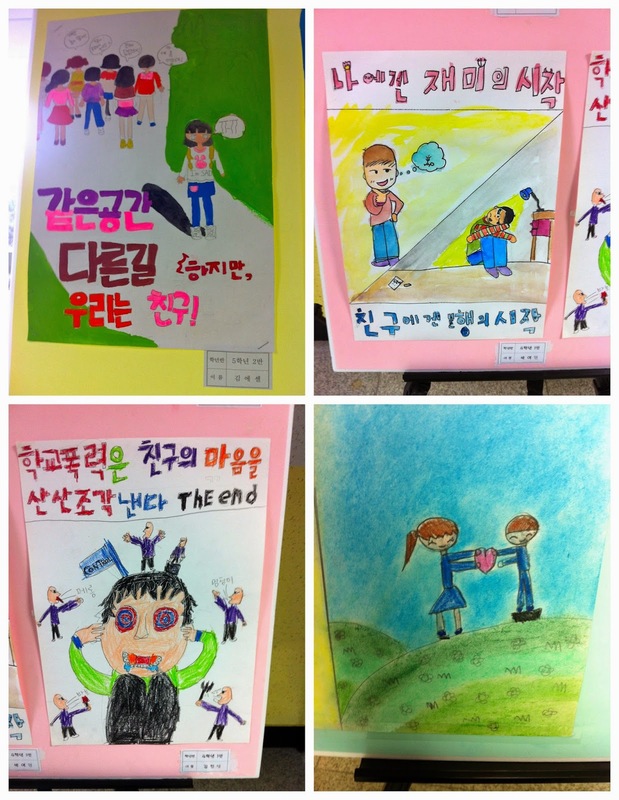 The only time I've talked about school bullying in Korea was a unique conversation where I learned that if a Korean child is adopted in Korea, by a Korean family, and kids at school know this, that child will be bullied and scarlet-lettered so to speak. Really hard information to hear. My students are very close and take it upon themselves to police each other, but kids are kids and that means that they are brutally cruel at times. Fights and mean words happen -- I'm glad your school is taking an active approach that involves the students being able to express their thoughts and take role in the protest! I've worried about that, too. There are enough teachers around but the possibility of a serious accident or injury where I'm the sole adult makes me uneasy.